This document is historically and remarkably marvelous for all Koun Khmers to read and conceptualize it. It is a letter by King Sisowath to King Napoleon III to intervene the matter of border encroachment by Siam and Annam. 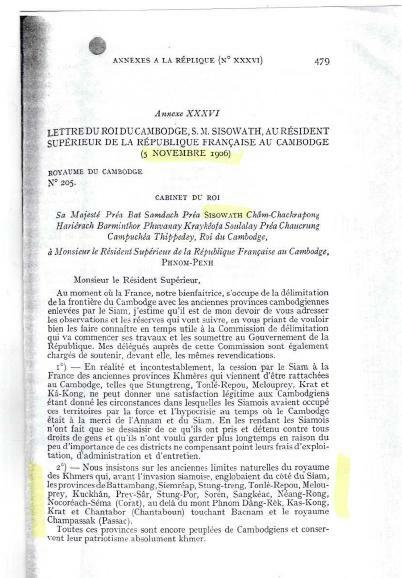 We don’t really understand the whole story that by this letter, French protested the Siam to return back all provinces controlled by Siem to Cambodia. But at least, by the affair of colonialism to delineating its territory and the intellectual crusading for territorial independence of King Sisowath, Cambodia has been maintained its current map and national identity to the world that this greatest kingdom in the past has still remained its heritage and identity….cheer to French and Cambodian nationalist leaders! At a time when France, our benefactor, is busy with the delimitation of the border of Cambodia with the former Cambodian provinces abducted by Siam, I believe that it is my duty to send you the following observations and reservations, and I am also asking you to please let these be known, at an opportune time, to the delimitation Commission which will start its works and submit them to the Government of the (French) Republic. My delegates within this Commission are also in charge of supporting the same demands in front of the Commission. 1- In reality and incontestably, the cession to Siam by France of the former Khmer provinces which have just been re-attached to Cambodia – such as Stung Treng, Tonle Ropov, M’lou Prey, Krat and Koh Kong – cannot provide legitimate satisfaction to Cambodians given the circumstances in which the Siamese occupied these territories by force and by hypocrisy during the time when Cambodia was at the mercy of Annam (Vietnam) and Siam. 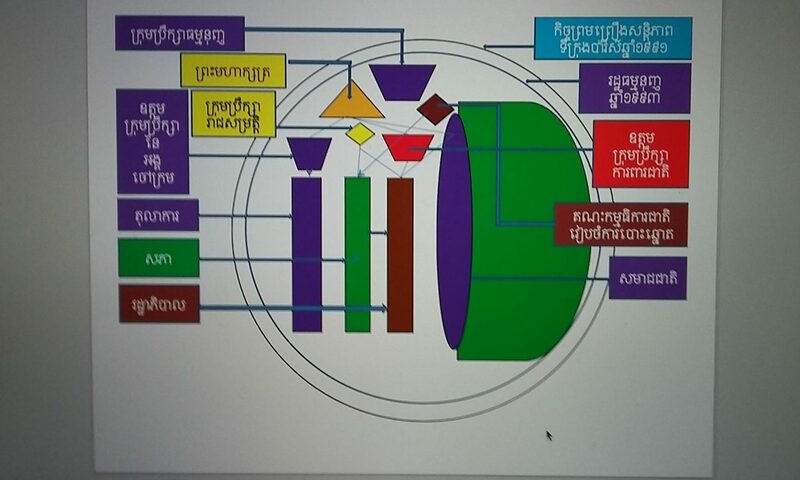 By returning back these provinces (to Cambodia), the Siamese are only divesting what they took and detained against all rights of the people [of Cambodia], and that they do not want to keep them much longer because the lack of importance of these districts cannot compensate their costs of their exploitation, administration and maintenance. 2- We insist on the former natural limits of the Khmer Kingdom which, prior to the Siamese invasion, included on Siam’s side the provinces of Battambang, Siem Reap, Stung Treng, Tonle Ropov, M’lou Prey, Kuckhan [currently known as Sisaket], Prey Sar, Soren [Surin], Sankeac [Sangka], Neang Rong, Nokoreach Seima (Korat), beyond the Phnom Dangrek Mountain, Koh Kong, Krat and Chantabor (Chantaboun [Chantaburi]) touching upon Bacnam and the Kingdom of Champassac (Passac). All these provinces are still populated by Cambodians and they preserve their absolute Khmer patriotism. 3- The richest provinces of Cambodia are precisely Battambang and Siem Reap; in the latter province, (temple) ruins of our Kingdom old powerful capital still subsist, they are shining proof of the magnificence of our ancestors. These two provinces, just like the others, were never given to Siam by any of my predecessors, and our claims in view of their return back to Cambodia have never ceased and will never cease as long as we do not receive satisfaction in this regard. Our past numerous claims are testimonials to this effect. Independently to all historical justifications which confirm our rights on these two provinces, the 15 July 1867 Treaty concluded between France and Siam mentioned that the December 1863 Treaty, allegedly concluded between the Kingdoms of Cambodia and Siam, was annulled and that Siam renounces forever all vassalage from the part of Cambodia. 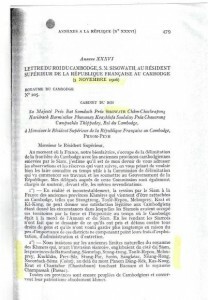 Therefore, this clause completely disengaged Siam from the Khmer Kingdom, which, by this treaty, should recover all her territorial integrity, and if the then-French diplomats – through Article 4 of this same 15 July 1867 treaty – consented, without consulting the Cambodian Government or the Cochinchina Governor, that the provinces of Battambang and Siem Reap remained with Siam, they were absolutely being cheated by the Siamese in their persuasion of the existence of an alleged treaty unknown to the Cambodians, and within Siam’s rights and value of these territories. I am adding, that to my knowledge, this alleged treaty concluded on December 1863 between Cambodia and Siam never regularly existed and that it is only fair to provide us with satisfaction. In fact, in spite of our profound and sincere gratitude towards the protectorate Government, we cannot prevent ourselves from wondering whether such diplomatic action to get rid of our assets, behind our back and without our consent, could last. In all cases and irrespective of the results of the works [accomplished] by the current Commission, and the ulterior diplomatic actions regarding our borders with Siam, not including the cession by Cambodia of her valuable provinces of Battambang and Siem Reap – along with all its dependences –, we are asking to reserve forever, for us and all our successors, the right to prevail our demands until full justice and satisfaction are given to us. These are, Mr. Governor, the observations and the reservations that I make it as my duty to send to you, while assuring you that they perfectly represent the unanimous feelings of my Government and those of my people. Beyond our strong attachment to these provinces – the irregular detention of which is a real heartache for all the Cambodian people – you are aware of all the difficulties resulting from this detention that our neighbors are continuously creating through the encroachments of our territory, the robberies, the plundering actions and the daily crimes committed in our country by perpetrators who can easily find refuge on their side where they remained unpunished. These acts are actually taking place as they have been proven by the reports from your [French provincial] Governors and our provincial Governors. I believe that this situation which is absolutely prejudicial to all public security principle will become worst as long as the provinces of Battambang and Siem Reap, the most contiguous ones to Cambodia, are not returned to us. Please accept, Mr. Governor, the assurance of my highest regards. Done in our Royal Palace in Phnom Penh on Monday, the 4th day of the waning moon of the 2nd month of the Cholasakrach 1268, of the year of the Momi (Horse) Atthasak, the third of the reign, i.e. the 5th of November 1906 of the Christian calendar.